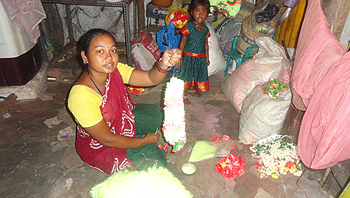 We provide the Self Employment Training programmes from the various slums of the districts. We provide time-bound residential training to rural unemployed youth and invest for there development. We will be "grounded in rural areas" to aid unemployed rural youth access vocational skill training. We covered all the districts in Tamilnadu will have these training institutes operating under SOLS (Sanctuary of Living Springs) India. The concept of SOLS India was conceived by the Ministry of Rural Development on the lines of RUDSET (Rural Development and Self Employment Training) that were introduced as micro model in the 2005s in Red Hills, Tamil Nadu. RUDSET are conceived as to provide skill training, and are aimed at addressing the slum's youth in skill requirements for rural entrepreneurs. Our Team led by the programmes include tailoring and embroidery, fashion jewellery, AC and refrigerator servicing, servicing of home appliances, mobile phone servicing, fresh water and ornamental fish culture, car driving, photo lamination, jute products manufacturing, house wares and electrical motor repairing, readymade garment designing and manufacturing, and computer training for differently abled.